If you haven’t watched Gate Episode 8 yet, please stop reading this immediately, buy a Crunchyroll membership (if you don’t already have one), and watch the episode. Of course, if you haven’t watched the previous episodes, watch them first. There are moments in episode 8 that are worth the four hours of investment to watch all of the episodes so far! In other words, there are spoilers beyond this point. I’ve enjoyed Gate from its first episode. It avoids most of the cliches that plague too many anime series. It offers what I think is a realistic portrayal of what would happen if a parallel fantasy world would invade Japan — including what the Self Defense Force (SDF) would do in response. Episode 8 was no different. It starts with our heroes coming to Japan to testify before the Diet. 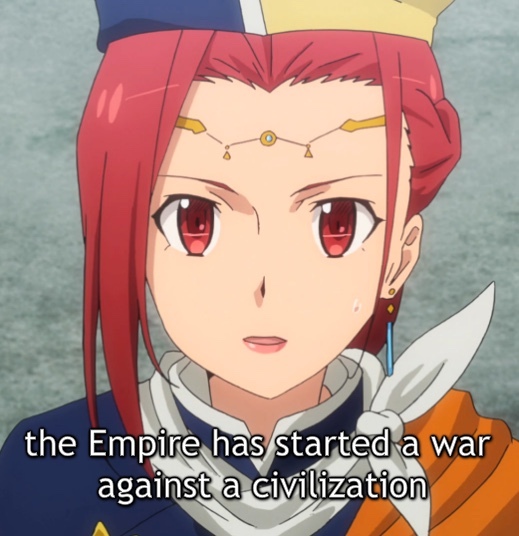 For me, the episode started on a high note, when the Princess Pina Co Lada* looks up at buildings that seem to touch the sky and says, “…the empire has started a war against a civilization capable of building these structures.” I’ve often wondered what drove the emperor to start the war. The decision is incomprehensible! It seems the Princess has come to understand that as well. Princess Pina realizing they’ve picked a fight they can’t win. I almost feel sorry for her! Picture from Crunchyroll’s stream of the anime Gate. The surprises start early, when their contact, Public Safety’s Komakado, shares the results of his research into Lieutenant Yōji Itami. Itami, it turns out, is not only a Ranger; he’s also Special Forces. One of the members of his Third Recon Team, Shino Kuribayashi, is an SDF regular who thinks Itami is a slacker. In previous episodes, she had a hard time accepting he was a Ranger. Finding out he was also Special Forces brought her to tears. My favorite moment came during testimony before the Diet. 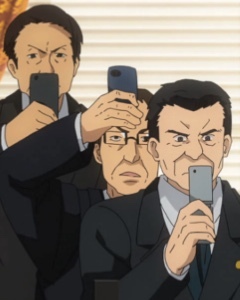 Diet Member Kouhara, hostile to the SDF, intended to use the public proceedings to discredit the SDF, so she focused her questions on the loss of civilian life during the fire dragon’s attack. First, she questioned Itami, whose honest answers didn’t match her agenda. Undismayed, she called on Lelei La Lelena, who answered in Japanese that the SDF had treated her and her people very well. Obviously, that wasn’t what she wanted to hear, so she called on Tuka Luna Marceau. As you can imagine, things didn’t go well for Kouhara, because Tuka had only positive things to say about the SDF. Kouhara also had the bad taste to ask Tuka if her elvish ears were real. Tuka, gracious as always, offered to let the Diet Member touch them to be sure. Tuka’s ears were quite a hit with the Diet Members! Picture from Crunchyroll’s stream of the anime Gate. Kouhara’s fatal mistake, though, was mistaking Rory Mercury‘s black, formal priestess attire as an outfit of mourning. After Rory’s answers about life in the refugee camp didn’t fit her agenda, the Diet Member pushed harder, saying that the SDF lost no one — didn’t even experience any injuries — during the dragon’s attack. Wasn’t Rory offended that a quarter of the refugees died when they were supposed to be under the SDF’s protection? Rory’s tone, her inflection, even her volume were absolutely perfect. I haven’t laughed so hard for so long in years. 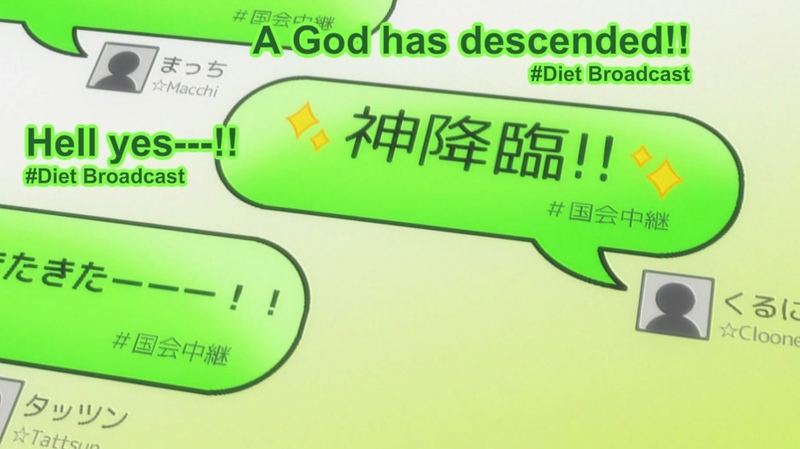 Gate’s equivalent of the Twitter-sphere reacted favorably to the announcement of Rory’s divinity! Picture from Crunchyroll’s stream of the anime Gate. Lele then launched into a description of her world, including how Rory was currently a demigod about to ascend to the spiritual plane. That signaled Kouhara’s complete defeat. There were other shocks this episode, like finding out at the end that Itami has an ex-wife named Risa (not sure if the shock within his unit was that he had had a wife at all, or if she was his ex). Still, my favorite part of the episode was seeing Rory demolish Kouhara’s plans to use the military as a scapegoat to further her political agenda. Gate is my favorite series this season. If it keeps on track, it might just become one of my all-time favorite series. Its blend of realism, pacing, character development, and animation really appeal to me. * Really? She shares a name with an alcoholic drink? I’m waiting to see if the writers have some reveal about this later on — like maybe her father really doesn’t like her? What does the emperor know about our world? In the meantime, I just chuckle when I see her name.